To his countrymen in eastern Europe this record of the work already accomplished by Nikola Tesla is respectfully dedicated. The electrical problems of the present day lie largely in the economical transmission of power and in the radical improvement of the means and methods of illumination. To many workers and thinkers in the domain of electrical invention, the apparatus and devices that are familiar, appear cumbrous and wasteful, and subject to severe limitations. They believe that the principles of current generation must be changed, the area of current supply be enlarged, and the appliances used by the consumer be at once cheapened and simplified. The brilliant successes of the past justify them in every expectancy of still more generous fruition. The present volume is a simple record of the pioneer work done in such departments up to date, by Mr. Nikola Tesla, in whom the world has already recognized one of the foremost of modern electrical investigators and inventors. No attempt whatever has been made here to emphasize the importance of his researches and discoveries. Great ideas and real inventions win their own way, determining their own place by intrinsic merit. But with the conviction that Mr. Tesla is blazing a path that electrical development must follow for many years to come, the compiler has endeavored to bring together all that bears the impress of Mr. Tesla's genius, and is worthy of preservation. Aside from its value as showing the scope of his inventions, this volume may be of service as indicating the range of his thought. There is intellectual profit in studying the push and play of a vigorous and original mind. Although the lively interest of the public in Mr. Tesla's work is perhaps of recent growth, this volume covers the results of full ten years. It includes his lectures, miscellaneous articles[Pg vi] and discussions, and makes note of all his inventions thus far known, particularly those bearing on polyphase motors and the effects obtained with currents of high potential and high frequency. It will be seen that Mr. Tesla has ever pressed forward, barely pausing for an instant to work out in detail the utilizations that have at once been obvious to him of the new principles he has elucidated. Wherever possible his own language has been employed. It may be added that this volume is issued with Mr. Tesla's sanction and approval, and that permission has been obtained for the re-publication in it of such papers as have been read before various technical societies of this country and Europe. Mr. Tesla has kindly favored the author by looking over the proof sheets of the sections embodying his latest researches. The work has also enjoyed the careful revision of the author's friend and editorial associate, Mr. Joseph Wetzler, through whose hands all the proofs have passed. THE TESLA EFFECTS WITH HIGH FREQUENCY AND HIGH POTENTIAL CURRENTS. 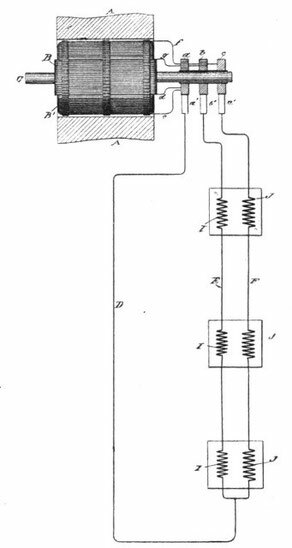 APPENDIX: EARLY PHASE MOTORS AND THE TESLA OSCILLATORS. Chapter I: Biographical and Introductory. As an introduction to the record contained in this volume of Mr. Tesla's investigations and discoveries, a few words of a biographical nature will, it is deemed, not be out of place, nor other than welcome. be said to have begun work on the ideas that fructified ultimately in his rotating field motors. In the second year of his Gratz course, Mr. Tesla gave up the notion of becoming a teacher, and took up the engineering curriculum. His studies ended, he returned home in time to see his father die, and then went to Prague and Buda-Pesth to study languages, with the object of qualifying himself broadly for the practice of the engineering profession. For a short time he served as an assistant in the Government Telegraph Engineering Department, and then became associated with M. Puskas, a personal and family friend, and other exploiters of the telephone in Hungary. He made a number of telephonic inventions, but found his opportunities of benefiting by them limited in various ways. To gain a wider field of action, he pushed on to Paris and there secured employment as an electrical engineer with one of the large companies in the new industry of electric lighting. It was during this period, and as early as 1882, that he began serious and continued efforts to embody the rotating field principle in operative apparatus. He was enthusiastic about it; believed it to mark a new departure in the electrical arts, and could think of nothing else. In fact, but for the solicitations of a few friends in commercial circles who urged him to form a company to exploit the invention, Mr. Tesla, then a youth of little worldly experience, would have sought an immediate opportunity to publish his ideas, believing them to be worthy of note as a novel and radical advance in electrical theory as well as destined to have a profound influence on all dynamo electric machinery. At last he determined that it would be best to try his fortunes in America. In France he had met many Americans, and in contact with them learned the desirability of turning every new idea in electricity to practical use. He learned also of the ready encouragement given in the United States to any inventor who could attain some new and valuable result. The resolution was formed with characteristic quickness, and abandoning all his prospects in Europe, he at once set his face westward. own inventions to develop, Mr. Tesla could long remain in even the most delightful employ; and, his work now attracting attention, he left the Edison ranks to join a company intended to make and sell an arc lighting system based on some of his inventions in that branch of the art. With unceasing diligence he brought the system to perfection, and saw it placed on the market. But the thing which most occupied his time and thoughts, however, all through this period, was his old discovery of the rotating field principle for alternating current work, and the application of it in motors that have now become known the world over. Strong as his convictions on the subject then were, it is a fact that he stood very much alone, for the alternating current had no well recognized place. Few electrical engineers had ever used it, and the majority were entirely unfamiliar with its value, or even its essential features. Even Mr. Tesla himself did not, until after protracted effort and experimentation, learn how to construct alternating current apparatus of fair efficiency. But that he had accomplished his purpose was shown by the tests of Prof. Anthony, made in the of winter 1887-8, when Tesla motors in the hands of that distinguished expert gave an efficiency equal to that of direct current motors. Nothing now stood in the way of the commercial development and introduction of such motors, except that they had to be constructed with a view to operating on the circuits then existing, which in this country were all of high frequency. 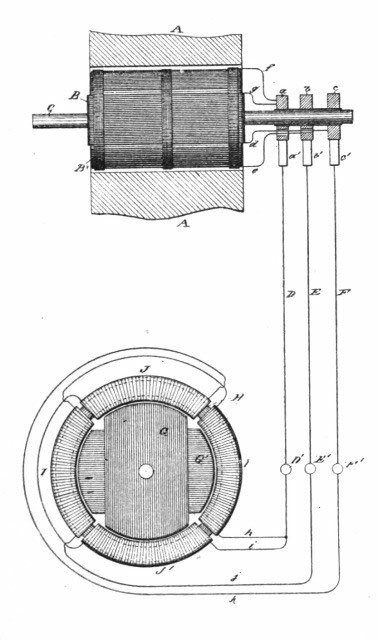 The first full publication of his work in this direction—outside his patents—was a paper read before the American Institute of Electrical Engineers in New York, in May, 1888 (read at the suggestion of Prof. Anthony and the present writer), when he exhibited motors that had been in operation long previous, and with which his belief that brushes and commutators could be dispensed with, was triumphantly proved to be correct. The section of this volume devoted to Mr. Tesla's inventions in the utilization of polyphase currents will show how thoroughly from the outset he had mastered the fundamental idea and applied it in the greatest variety of ways. was rewarded very quickly in this field with results of the most surprising nature. A slight acquaintance with some of these experiments led the compiler of this volume to urge Mr. Tesla to repeat them before the American Institute of Electrical Engineers. This was done in May, 1891, in a lecture that marked, beyond question, a distinct departure in electrical theory and practice, and all the results of which have not yet made themselves fully apparent. The New York lecture, and its successors, two in number, are also included in this volume, with a few supplementary notes. Mr. Tesla's work ranges far beyond the vast departments of polyphase currents and high potential lighting. The "Miscellaneous" section of this volume includes a great many other inventions in arc lighting, transformers, pyro-magnetic generators, thermo-magnetic motors, third-brush regulation, improvements in dynamos, new forms of incandescent lamps, electrical meters, condensers, unipolar dynamos, the conversion of alternating into direct currents, etc. It is needless to say that at this moment Mr. Tesla is engaged on a number of interesting ideas and inventions, to be made public in due course. The present volume deals simply with his work accomplished to date. Chapter II. A New System of Alternating Current Motors and Transformers. The present section of this volume deals with polyphase currents, and the inventions by Mr. Tesla, made known thus far, in which he has embodied one feature or another of the broad principle of rotating field poles or resultant attraction exerted on the armature. It is needless to remind electricians of the great interest aroused by the first enunciation of the rotating field principle, or to dwell upon the importance of the advance from a single alternating current, to methods and apparatus which deal with more than one. Simply prefacing the consideration here attempted of the subject, with the remark that in nowise is the object of this volume of a polemic or controversial nature, it may be pointed out that Mr. Tesla's work has not at all been fully understood or realized up to date. To many readers, it is believed, the analysis of what he has done in this department will be a revelation, while it will at the same time illustrate the beautiful flexibility and range of the principles involved. It will be seen that, as just suggested, Mr. Tesla did not stop short at a mere rotating field, but dealt broadly with the shifting of the resultant attraction of the magnets. It will be seen that he went on to evolve the "multiphase" system with many ramifications and turns; that he showed the broad idea of motors employing currents of differing phase in the armature with direct currents in the field; that he first described and worked out the idea of an armature with a body of iron and coils closed upon themselves; that he worked out both synchronizing and torque motors; that he explained and illustrated how machines of ordinary construction might be adapted to his system; that he employed condensers in field and armature circuits, and went to the bottom of the fundamental principles, testing, approving or rejecting, it would appear, every detail that inventive ingenuity could hit upon. Now that opinion is turning so emphatically in favor of lower frequencies, it deserves special note that Mr. Tesla early recognized the importance of the low frequency feature in motor work. 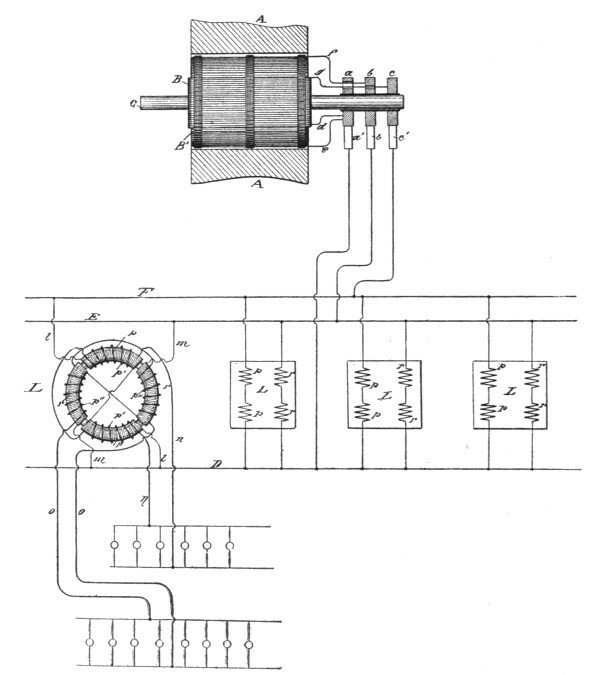 In fact his first motors exhibited publicly—and which, as Prof. Anthony showed in his tests in the winter of 1887-8, were the equal of direct current motors in efficiency, output and starting torque—were of the low frequency type. The necessity arising, however, to utilize these motors in connection with the existing high frequency circuits, our survey reveals in an interesting manner Mr. Tesla's fertility of resource in this direction. But that, after exhausting all the possibilities of this field, Mr. Tesla returns to low frequencies, and insists on the superiority of his polyphase system in alternating current distribution, need not at all surprise us, in view of the strength of his convictions, so often expressed, on this subject. This is, indeed, significant, and may be regarded as indicative of the probable development next to be witnessed. Incidental reference has been made to the efficiency of rotating field motors, a matter of much importance, though it is not the intention to dwell upon it here. Prof. Anthony in his remarks before the American Institute of Electrical Engineers, in May, 1888, on the two small Tesla motors then shown, which he had tested, stated that one gave an efficiency of about 50 per cent. and the other a little over sixty per cent. In 1889, some tests were reported from Pittsburgh, made by Mr. Tesla and Mr. Albert Schmid, on motors up to 10 h. p. and weighing about 850 pounds. These machines showed an efficiency of nearly 90 per cent. With some larger motors it was then found practicable to obtain an efficiency, with the three wire system, up to as high as 94 and 95 per cent. These interesting figures, which, of course, might be supplemented by others more elaborate and of later date, are cited to show that the efficiency of the system has not had to wait until the present late day for any demonstration of its commercial usefulness. An invention is none the less beautiful because it may lack utility, but it must be a pleasure to any inventor to know that the ideas he is advancing are fraught with substantial benefits to the public. Chapter III: The Tesla Rotating Magnetic Field.—Motors With Closed Conductors.—Synchronizing Motors.—Rotating Field Transformers. The best description that can be given of what he attempted, and succeeded in doing, with the rotating magnetic field, is to be found in Mr. Tesla's brief paper explanatory of his rotary current, polyphase system, read before the American Institute of Electrical Engineers, in New York, in May, 1888, under the title "A New System of Alternate Current Motors and Transformers." As a matter of fact, which a perusal of the paper will establish, Mr. Tesla made no attempt in that paper to describe all his work. It dealt in reality with the few topics enumerated in the caption of this chapter. Mr. Tesla's reticence was no doubt due largely to the fact that his action was governed by the wishes of others with whom he was associated, but it may be worth mention that the compiler of this volume—who had seen the motors running, and who was then chairman of the Institute Committee on Papers and Meetings—had great difficulty in inducing Mr. Tesla to give the Institute any paper at all. Mr. Tesla was overworked and ill, and manifested the greatest reluctance to an exhibition of his motors, but his objections were at last overcome. The paper was written the night previous to the meeting, in pencil, very hastily, and under the pressure just mentioned. The subject which I now have the pleasure of bringing to your notice is a novel system of electric distribution and transmission of power by means of alternate currents, affording peculiar advantages, particularly in the way of motors, which I am confident will at once establish the superior adaptability of these currents to the transmission of power and will show that many results heretofore unattainable can be reached by their use; results which are very much desired in the practical operation of such systems, and which cannot be accomplished by means of continuous currents. In our dynamo machines, it is well known, we generate alternate currents which we direct by means of a commutator, a complicated device and, it may be justly said, the source of most of the troubles experienced in the operation of the machines. Now, the currents so directed cannot be utilized in the motor, but they must—again by means of a similar unreliable device—be reconverted into their original state of alternate currents. The function of the commutator is entirely external, and in no way does it affect the internal working of the machines. In reality, therefore, all machines are alternate current machines, the currents appearing as continuous only in the external circuit during their transit from generator to motor. In view simply of this fact, alternate currents would commend themselves as a more direct application of electrical energy, and the employment of continuous currents would only be justified if we had dynamos which would primarily generate, and motors which would be directly actuated by, such currents. But the operation of the commutator on a motor is twofold; first, it reverses the currents through the motor, and secondly, it effects automatically, a progressive shifting of the poles of one of its magnetic constituents. 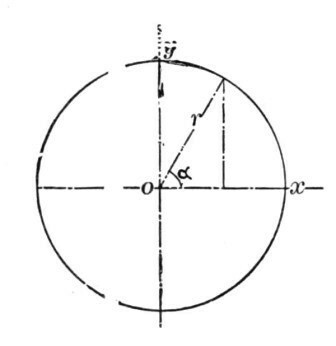 Assuming, therefore, that both of the useless operations in the systems, that is to say, the directing of the alternate currents on the generator and reversing the direct currents on the motor, be eliminated, it would still be necessary, in order to cause a rotation of the motor, to produce a progressive[Pg 11] shifting of the poles of one of its elements, and the question presented itself—How to perform this operation by the direct action of alternate currents? I will now proceed to show how this result was accomplished. 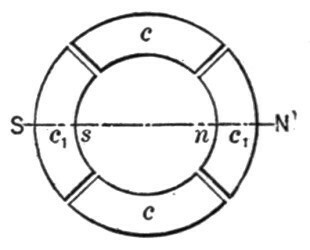 c c being nil, since these coils are included in the circuit of coil C.
In Fig. 2, the armature coils are shown in a more advanced position, one-eighth of one revolution being completed. Fig. 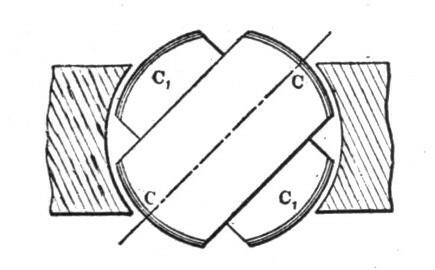 2a illustrates the corresponding magnetic condition of the ring. 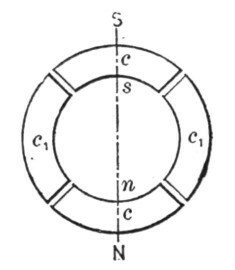 At this moment the coil C1 generates a current of the same direction as previously, but weaker, producing the poles n1 s1 upon the ring; the coil C also generates a current of the same direction, and the connections may be such that the coils c c produce the poles n s, as shown in Fig. 2a. 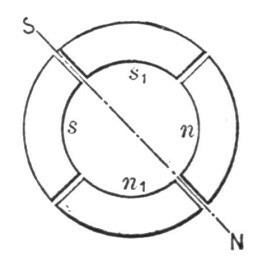 The resulting polarity is indicated by the letters N S, and it will be observed that the poles of the ring have been shifted one-eighth of the periphery of the same. In Fig. 3 the armature has completed one quarter of one revolution. In this phase the current in coil C is a maximum, and of such direction as to produce the poles N S in Fig. 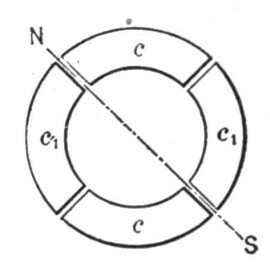 3a, whereas the current in coil C1 is nil, this coil being at its neutral position. The poles N S in Fig. 3a are thus shifted one quarter of the circumference of the ring. atively weaker poles n s in Fig. 4a. 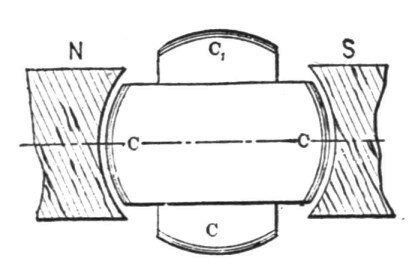 The current in the coil C1 is of the same strength, but opposite direction. Its effect is, therefore, to produce upon the ring the poles n1 s1, as indicated, and a polarity, N S, results, the poles now being shifted three-eighths of the periphery of the ring. In Fig. 5 one half of one revolution of the armature is completed, and the resulting magnetic condition of the ring is indicated in Fig. 5a. 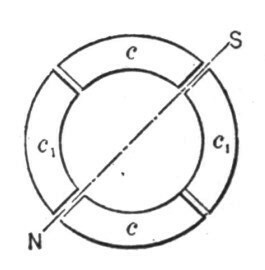 Now the current in coil C is nil, while the coil C1 yields its maximum current, which is of the same direction as previously; the magnetizing effect is, therefore, due to the coils, c1 c1 alone, and, referring to Fig. 5a, it will be observed that the poles N S are shifted one half of the circumference of the ring. During the next half revolution the operations are repeated, as represented in the Figs. 6 to 8a. cally the same. Instead of using four wires, with like result, three wires may be used, one forming a common return for both circuits. a direction always opposite to the supposed movement of the poles. If a paper with filings is put flat upon the ring and the current turned on suddenly, the existence of a magnetic whirl may easily be observed. Obviously, the rotation of the poles produces corresponding inductive effects and may be utilized to generate currents in a closed conductor placed within the influence of the poles. 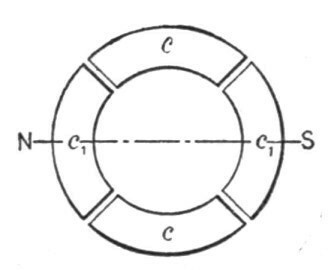 For this purpose it is convenient to wind a ring with two sets of superimposed coils forming respectively the primary and secondary circuits, as shown in Fig. 10. In order to secure the most economical results the magnetic circuit should be completely closed, and with this object in view the construction may be modified at will. The inductive effect exerted upon the secondary coils will be mainly due to the shifting or movement of the magnetic action; but there may also be currents set up in the circuits in consequence of the variations in the intensity of the poles. However, by properly designing the generator and determining the magnetizing effect of the primary coils, the latter element may be made to disappear. The intensity of the poles being maintained constant, the action of the apparatus will be perfect, and the same result will be secured as though the shifting were effected by means of a commutator with an infinite number of bars. In such case the theoretical relation between the energizing effect of each set of primary coils and their resultant magnetizing effect may be expressed by the equation of a circle having its centre coinciding with that of an orthogonal system of axes, and in which the radius represents the resultant and the co-ordinates both[Pg 16] of its components. These are then respectively the sine and cosine of the angle α between the radius and one of the axes (O X). Referring to Fig. 11, we have r2 = x2 + y2; where x = r cos α, and y = r sin α. Assuming the magnetizing effect of each set of coils in the transformer to be proportional to the current—which may be admitted for weak degrees of magnetization—then x = Kc and y = Kc1, where K is a constant and c and c1 the current in both sets of coils respectively. Supposing, further, the field of the generator to be uniform, we have for constant speed c1 = K1 sin α and c = K1 sin (90° + α) = K1 cos α, where K1 is a constant. See Fig. 12. That is, for a uniform field the disposition of the two coils at right angles will secure the theoretical result, and the intensity of the shifting poles will be constant. But from r2 = x2 + y2 it follows that for y = 0, r = x; it follows that the joint magnetizing effect of both sets of coils should be equal to the effect of one set when at its maximum action. In transformers and in a certain class of motors the fluctuation of the poles is not of great importance, but in another class of these motors it is desirable to obtain the theoretical result. In applying this principle to the construction of motors, two typical forms of motor have been developed. First, a form having a comparatively small rotary effort at the start but maintaining a perfectly uniform speed at all loads, which motor has been termed synchronous. Second, a form possessing a great rotary effort at the start, the speed being dependent on the load. the disc and increase the attraction exerted upon the same by the ring, and currents being generated in the coil as long as the speed of the armature is inferior to that of the poles, considerable work may be performed by such a motor even if the speed be below normal. The intensity of the poles being constant, no currents will be generated in the coil when the motor is turning at its normal speed. 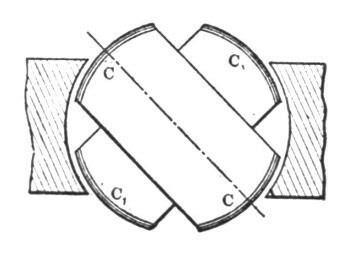 Instead of closing the coil upon itself, its ends may be connected to two insulated sliding rings, and a continuous current supplied to these from a suitable generator. The proper way to start such a motor is to close the coil upon itself until the normal speed is reached, or nearly so, and then turn on the continuous current. If the disc be very strongly energized by a continuous current the motor may not be able to start, but if it be weakly energized, or generally so that the magnetizing effect of the ring is preponderating, it will start and reach the normal speed. Such a motor will maintain absolutely the same speed at all loads. It has also been found that if the motive power of the generator is not excessive, by checking the motor the speed of the generator is diminished in synchronism with that of the motor. 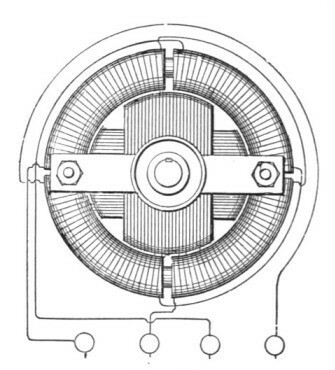 It is characteristic of this form of motor that it cannot be reversed by reversing the continuous current through the coil. The synchronism of these motors may be demonstrated experimentally in a variety of ways. For this purpose it is best to employ a motor consisting of a stationary field magnet and an armature arranged to rotate within the same, as indicated in Fig. 13. In this case the shifting of the poles of the armature produces a rotation of the latter in the opposite direction. It results therefrom that when the normal speed is reached, the poles of the armature assume fixed positions relatively to the[Pg 19] field magnet, and the same is magnetized by induction, exhibiting a distinct pole on each of the pole-pieces. If a piece of soft iron is approached to the field magnet, it will at the start be attracted with a rapid vibrating motion produced by the reversals of polarity of the magnet, but as the speed of the armature increases, the vibrations become less and less frequent and finally entirely cease. Then the iron is weakly but permanently attracted, showing that synchronism is reached and the field magnet energized by induction. The disc may also be used for the experiment. If held quite close to the armature it will turn as long as the speed of rotation of the poles exceeds that of the armature; but when the normal speed is reached, or very nearly so, it ceases to rotate and is permanently attracted. A crude but illustrative experiment is made with an incandescent lamp. Placing the lamp in circuit with the continuous current generator and in series with the magnet coil, rapid fluctuations are observed in the light in consequence of the induced currents set up in the coil at the start; the speed increasing, the fluctuations occur at longer intervals, until they entirely disappear, showing that the motor has attained its normal speed. A telephone receiver affords a most sensitive instrument; when connected to any circuit in the motor the synchronism may be easily detected on the disappearance of the induced currents. the quantity of the shifting magnetism constant, especially if the magnets are not properly subdivided. 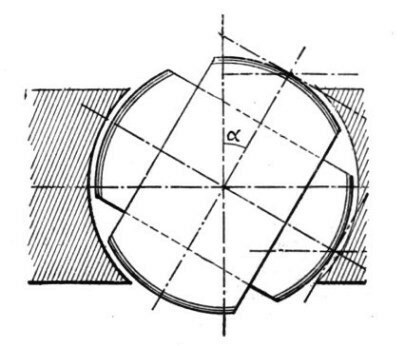 To obtain a rotary effort in these motors was the subject of long thought. 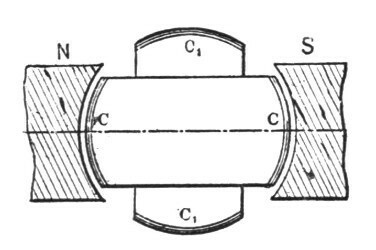 In order to secure this result it was necessary to make such a disposition that while the poles of one element of the motor are shifted by the alternate currents of the source, the poles produced upon the other elements should always be maintained in the proper relation to the former, irrespective of the speed of the motor. Such a condition exists in a continuous current motor; but in a synchronous motor, such as described, this condition is fulfilled only when the speed is normal. increasing the effort. Upon the load being taken off, the counter-electromotive force increases and less current passes through the primary or energizing coils. Without any load the speed is very nearly equal to that of the shifting poles of the field magnet. It will be found that the rotary effort in these motors fully equals that of the continuous current motors. The effort seems to be greatest when both armature and field magnet are without any projections; but as in such dispositions the field cannot be concentrated, probably the best results will be obtained by leaving pole projections on one of the elements only. Generally, it may be stated the projections diminish the torque and produce a tendency to synchronism. A characteristic feature of motors of this kind is their property of being very rapidly reversed. This follows from the peculiar action of the motor. Suppose the armature to be rotating and the direction of rotation of the poles to be reversed. 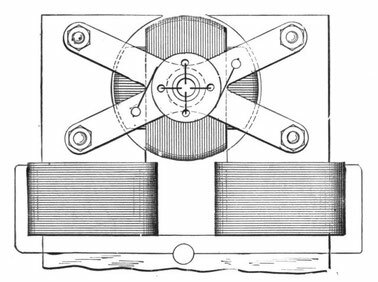 The apparatus then represents a dynamo machine, the power to drive this machine being the momentum stored up in the armature and its speed being the sum of the speeds of the armature and the poles. abnormally diminished by producing in this circuit an additional electromotive force. Owing to these causes the reversal is instantaneous. If it is desirable to secure a constant speed, and at the same time a certain effort at the start, this result may be easily attained in a variety of ways. 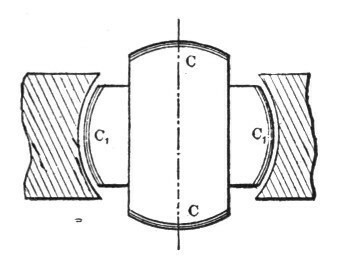 For instance, two armatures, one for torque and the other for synchronism, may be fastened on the same shaft and any desired preponderance may be given to either one, or an armature may be wound for rotary effort, but a more or less pronounced tendency to synchronism may be given to it by properly constructing the iron core; and in many other ways. manner, or alternately in opposition; in the latter case a motor with half the number of poles will result, and its action will be correspondingly modified. The Figs. 15, 16, and 17, show three different phases, the magnet coils in each circuit being connected alternately in opposition. In this case there will be always four poles, as in Figs. 15 and 17; four pole projections will be neutral; and in Fig. 16 two adjacent pole projections will have the same polarity. 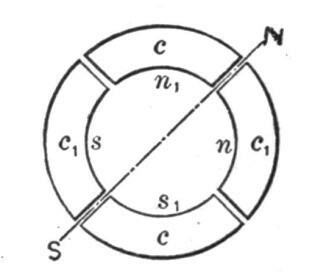 If the coils are connected in the same manner there will be eight alternating poles, as indicated by the letters n' s' in Fig. 15. In a general distribution system of this kind the following plan should be adopted. At the central station of supply a generator should be provided having a considerable number of poles. The motors operated from this generator should be of the synchronous type, but possessing sufficient rotary effort to insure their starting. With the observance of proper rules of construction it may be admitted that the speed of each motor will be in some inverse proportion to its size, and the number of poles should be chosen accordingly. Still, exceptional demands may modify this rule. In view of this, it will be advantageous to provide each motor with a greater number of pole projections or coils, the number being preferably a multiple of two and three. By this means, by simply changing the connections of the coils, the motor may be adapted to any probable demands. contacts. To avoid this, the motor should be provided with fourteen magnets and seven connected in each circuit, the magnets in each circuit alternating among themselves. 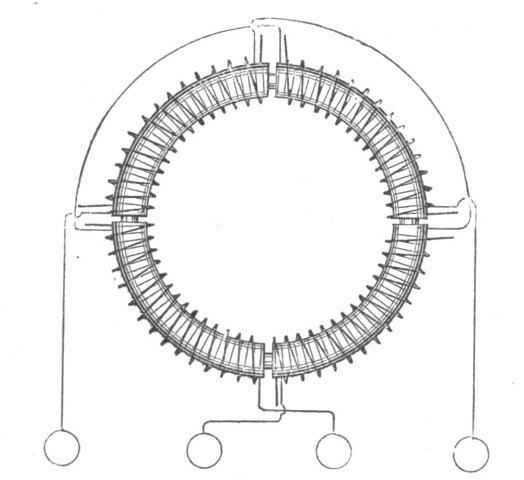 The armature should have fourteen closed coils. The action of the motor will not be quite as perfect as in the case of an even number of poles, but the drawback will not be of a serious nature. The speed of the motor will generally be dependent on the number of the poles, but there may be exceptions to this rule. The speed may be modified by the phase of the currents in the circuit or by the character of the current impulses or by intervals between each or between groups of impulses. Some of the possible cases are indicated in the diagrams, Figs. 18, 19, 20 and 21, which are self-explanatory. Fig. 18 represents the condition generally existing, and which secures the best result. 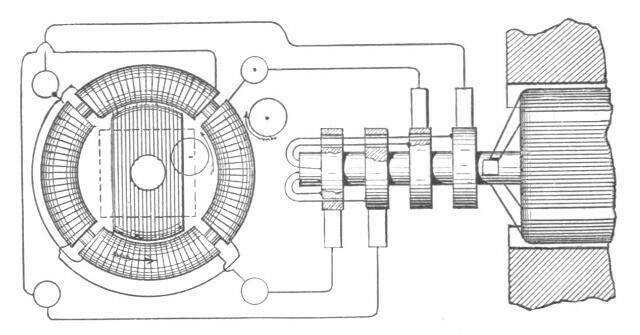 In such a case, if the typical form of motor illustrated in Fig. 9 is employed, one complete wave in each circuit will produce one revolution of the motor. In Fig. 19 the same result will be effected by one wave in each circuit, the impulses being successive; in Fig. 20 by four, and in Fig. 21 by eight waves. secondary coil will be proportional to the numerical sum of the variations in the strength of the exciting current per unit of time; whence it follows that for a given variation any prolongation of the primary current will result in a proportional loss. In order to obtain rapid variations in the strength of the current, essential to efficient induction, a great number of undulations are employed; from this practice various disadvantages result. These are: Increased cost and diminished efficiency of the generator; more waste of energy in heating the cores, and also diminished output of the transformer, since the core is not properly utilized, the reversals being too rapid. The inductive effect is also very small in certain phases, as will be apparent from a graphic representation, and there may be periods of inaction, if there are intervals between the succeeding current impulses or waves. In producing a shifting of the poles in a transformer, and thereby inducing currents, the induction is of the ideal character, being always maintained at its maximum action. It is also reasonable to assume that by a shifting of the poles less energy will be wasted than by reversals. In his earlier papers and patents relative to polyphase currents, Mr. Tesla devoted himself chiefly to an enunciation of the broad lines and ideas lying at the basis of this new work; but he supplemented this immediately by a series of other striking inventions which may be regarded as modifications and expansions of certain features of the Tesla systems. These we shall now proceed to deal with. tion. Fig. 22 is a diagrammatic illustration of a generator and single motor constructed and electrically connected in accordance with the invention. Fig. 23 is a diagram of the system as it is used in operating motors or converters, or both, in parallel, while Fig. 24 illustrates diagrammatically the manner of operating two or more motors or converters, or both, in series. Referring to Fig. 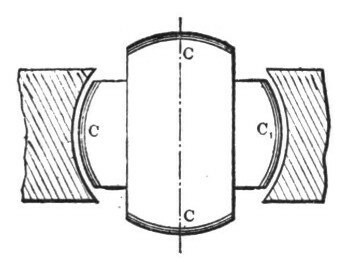 22, A A designate the poles of the field magnets of an alternating-current generator, the armature of which, being in this case cylindrical in form and mounted on a shaft, C, is wound longitudinally with coils B B'. 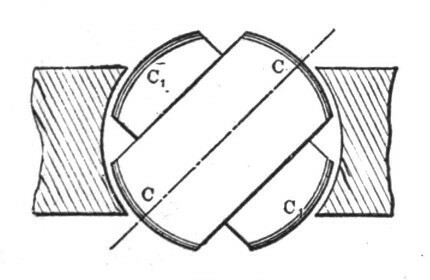 The shaft C carries three insulated contact-rings, a b c, to two of which, as b c, one terminal of each coil, as e d, is connected. The remaining terminals, f g, are both connected to the third ring, a.
nected to form two closed circuits. The terminals j k of the two sets or pairs of coils are connected, respectively, to the binding-posts E' F', and the other terminals, h i, are connected to a single binding-post, D'. To operate the motor, three line-wires are used to connect the terminals of the generator with those of the motor. 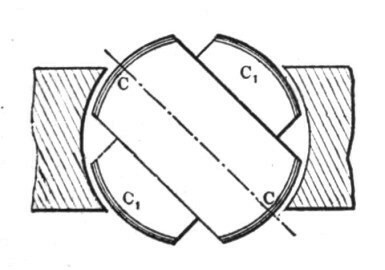 two coils I I; but as the coil B' moves from the position indicated it generates less current, while coil B, moving into the field, generates more. 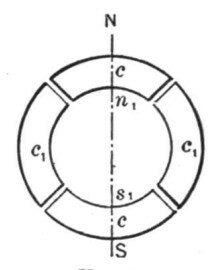 The current from coil B passes through the devices and wires designated by the letters d, c, c' F, F' k, J J, i, D', D, a', a, and g, and the position of the poles of the motor will be due to the resultant effect of the currents in the two sets of coils—that is, it will be advanced in proportion to the advance or forward movement of the armature coils. The movement of the generator-armature through one-quarter of a revolution will obviously bring coil B' into its neutral position and coil B into its position of maximum effect, and this shifts the poles ninety degrees, as they are fixed solely by coils B. This action is repeated for each quarter of a complete revolution. When more than one motor or other device is employed, they may be run either in parallel or series. In Fig. 23 the former arrangement is shown. The electrical device is shown as a converter, L, of which the two sets of primary coils p r are connected, respectively, to the mains F E, which are electrically connected with the two coils of the generator. The cross-circuit wires l m, making these connections, are then connected to the common return-wire D. The secondary coils p' p'' are in circuits n o, including, for example, incandescent lamps. Only one converter is shown entire in this figure, the others being illustrated diagrammatically. When motors or converters are to be run in series, the two wires E F are led from the generator to the coils of the first motor or converter, then continued on to the next, and so on through the whole series, and are then joined to the single wire D, which completes both circuits through the generator. This is shown in Fig. 24, in which J I represent the two coils or sets of coils of the motors. There are, of course, other conditions under which the same idea may be carried out. For example, in case the motor and generator each has three independent circuits, one terminal of each circuit is connected to a line-wire, and the other three terminals to a common return-conductor. This arrangement will secure similar results to those attained with a generator and motor having but two independent circuits, as above described. to those of the motor. Mr. Tesla states, however, that the results obtained in this manner show a lower efficiency than do the forms dwelt upon more fully above. CHAPTER V: Utilizing Familiar Types of Generator of the Continuous Current Type.